This remarkable chair is made of wood sourced from the Kilmarnock printing press which produced the first edition of Robert Burns’s work Poems Chiefly in the Scottish Dialect known as ‘The Kilmarnock Edition’. It was published on the 31st July 1786 at the cost of three shillings per copy. 612 copies were printed and the edition was sold out in just over a month after publication. 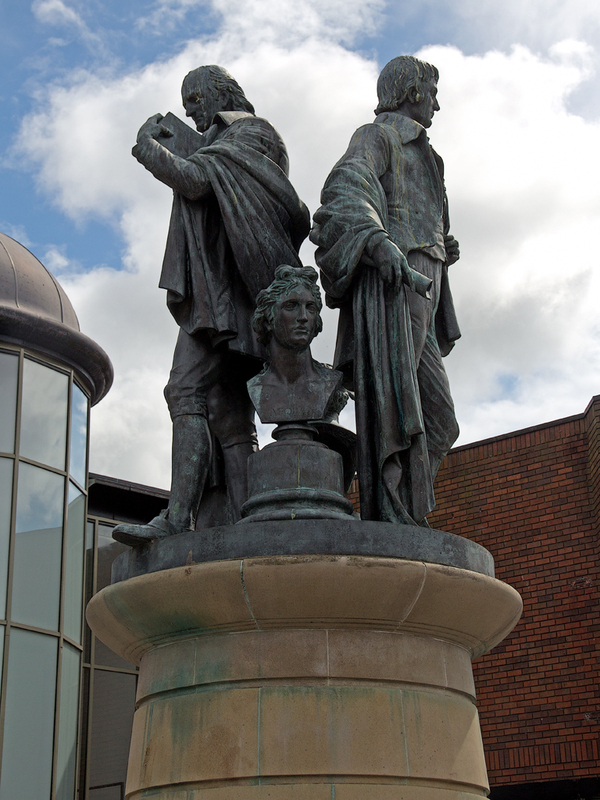 The printing press no longer exists but in its stead there are two statues: one of Burns and one of John Wilson (the owner of the press) to commemorate the publication of Burns’s first works. 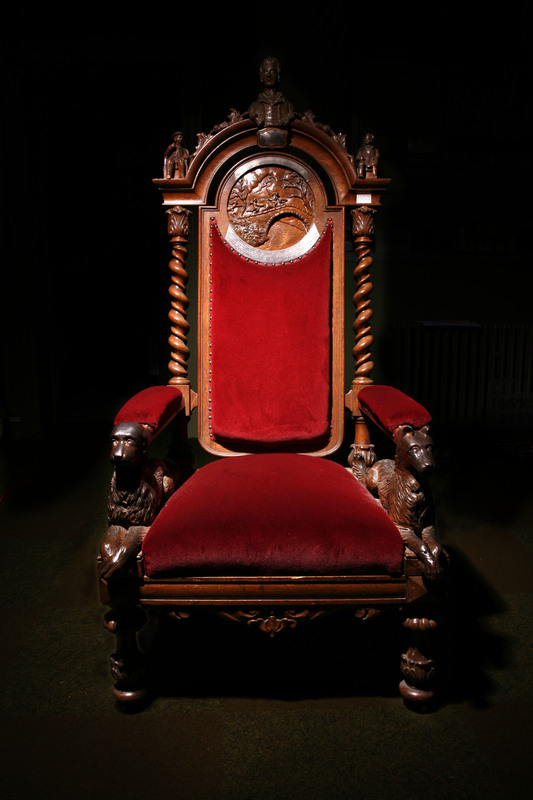 This chair was constructed in 1858, just before the Burns Centenary Festival in Ayr in 1859. The one hundredth year anniversary of the bard’s birth was celebrated far and wide by many. 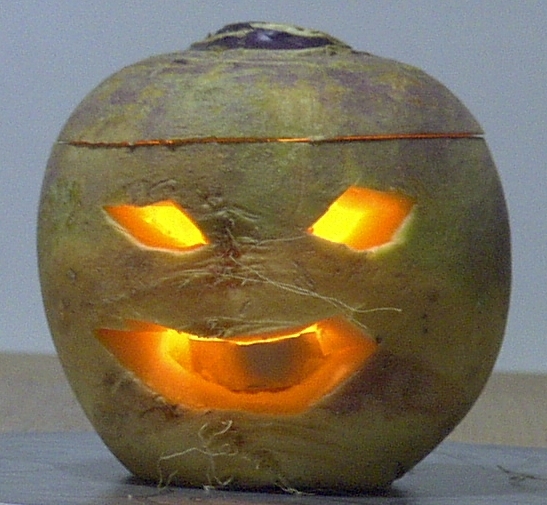 One contemporary counted 676 local festivals in Scotland alone, thus, showing the widespread popularity of Burns. 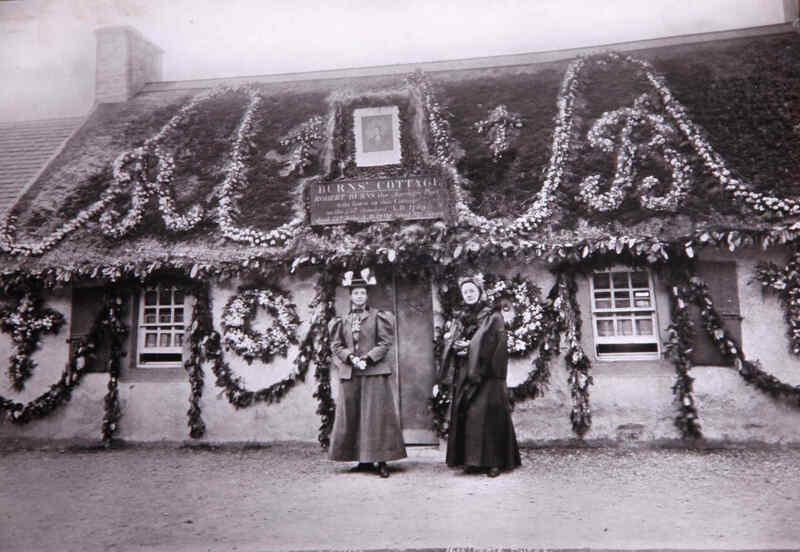 This photograph shows Annie Burns (Robert Burns’s granddaughter) and Martha Burns Everitt (his great granddaughter) outside the Burns Cottage which is the bards birthplace in Alloway. It is florally decorated for the centenary of Burns’s death. The chair has plush red velvet on the cushion and is elaborately carved with symbolism and references to some of Burns’s most loved works. Each arm rest ends with a carving of a dog, Luath and Caesar, from the poem ‘The Twa Dogs’. 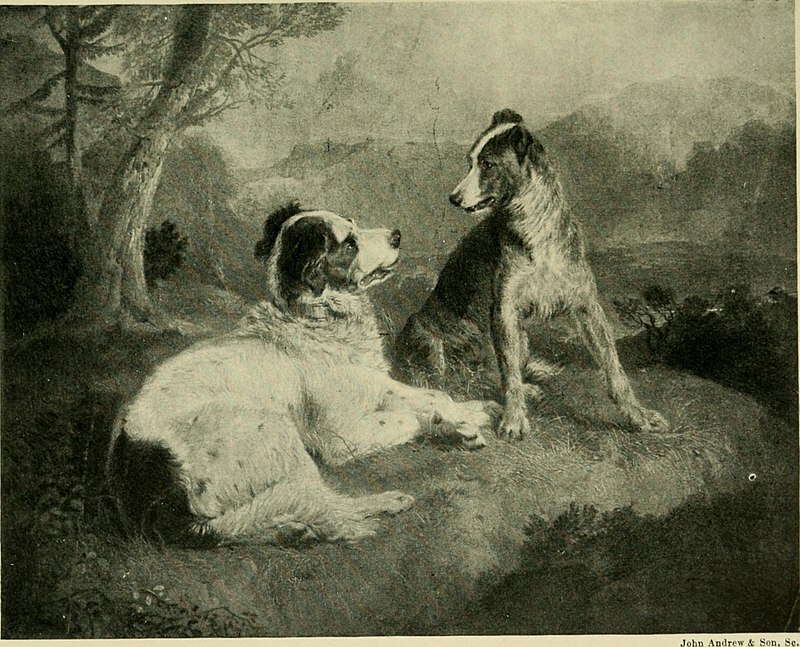 The Twa Dogs – a poem written by Robert Burns in 1786 – about Luath and Caesar. 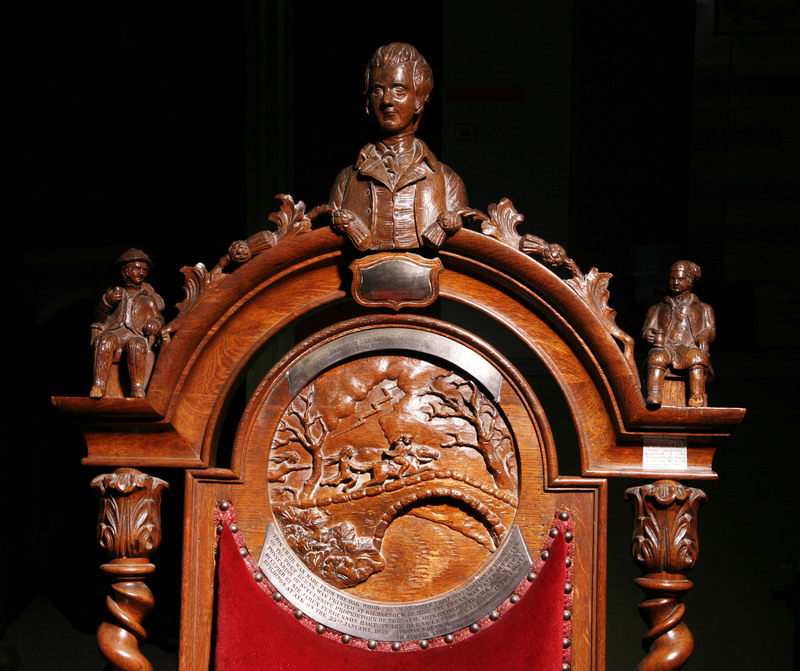 A carving of Robert Burns himself, after the artist Alexander Nasmyth’s famous portrait – whereby he is shown fashionably dressed in a waistcoat, tailcoat and stalk – is placed in the centre at the highest point of the back of the chair with the infamous characters Tam and Souter Johnnie from the narrative poem ‘Tam o’ Shanter’ on either side. 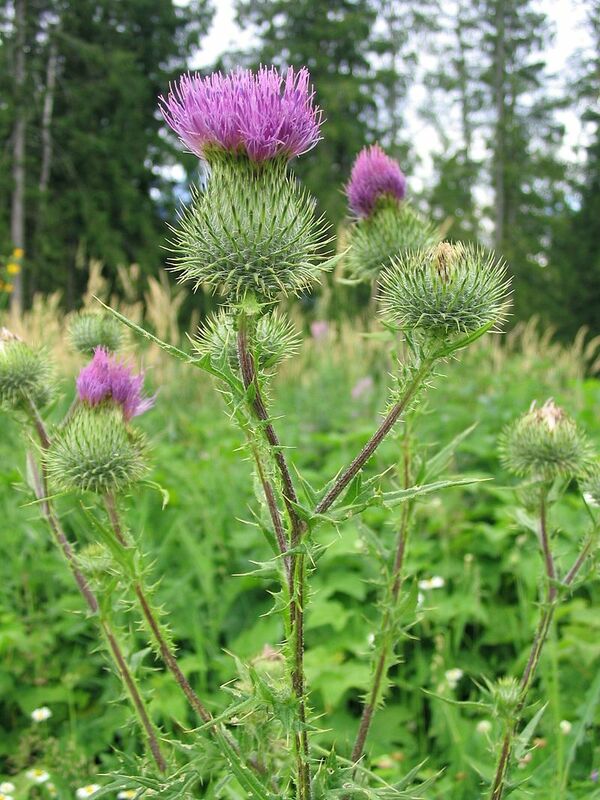 Thistles, commonly regarded as the floral national emblem of Scotland, decorate the gaps between the figures. Thistle – Scotland’s floral emblem. The central carving is of the climactic scene of Tam crossing the Brig o’ Doon atop of his trusty cuddie (horse in Scots) Meg with Nannie the witch at their heels. 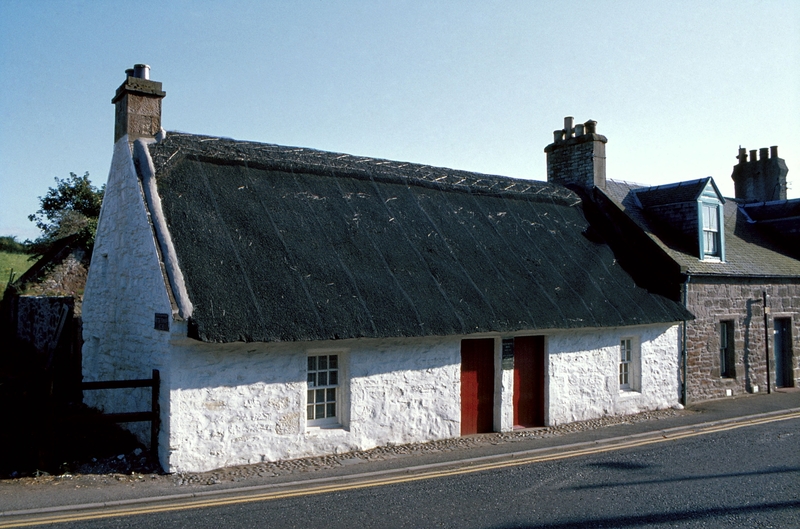 The Brig o’ Doon is actually a real bridge and is located in Alloway where Burns was born and lived for seven years. Brig o’ Doon, Alloway, South Ayrshire, Scotland. Brig o’ Doon scene from Burns’s narrative poem Tam o’ Shanter. A small plaque above this quotes a verse from Burns’s poem ‘The Vision’ which was written in 1785 and published in Poems, Chiefly in the Scottish Dialect. It takes the form of a poetic ‘dream vision’, a form used in medieval Scottish verse and revived by Allan Ramsay in his own poem ‘The Vision’, from which Burns takes his title and was influenced and inspired by immensely. In the long narrative poem, Burns as speaker returns from a hard day in the fields and, after resting by the fireside, falls into a dream state in which he is visited by Coila, a regional muse. Coila (whom the speaker is clearly attracted to) addresses Burns, describing how she watched his development from a young age – thereby offering an imaginative reworking of Burns’s emergence as a poetic talent. She ends with a confirmation of his poetic mission and crowns him as bard. The striking thing here is the self-consciousness Burns displays about his position even this early in his career. The inclusion of these particular carvings could be symbolism of the themes in which Burns explored most through his works: nature with the dogs representing this; the supernatural via the Brig o’ Doon scene; comradery through Tam and Souter Johnnie the “drouthy cronie” and the nature of the self and humankind through the quote from ‘The Vision’ and Robert Burns himself. Interestingly, during a visit to Burns Cottage in 1965, the boxing legend Muhammad Ali was pictured sitting in this chair. Following this visit he was made an honorary member of Alloway Burns Club. 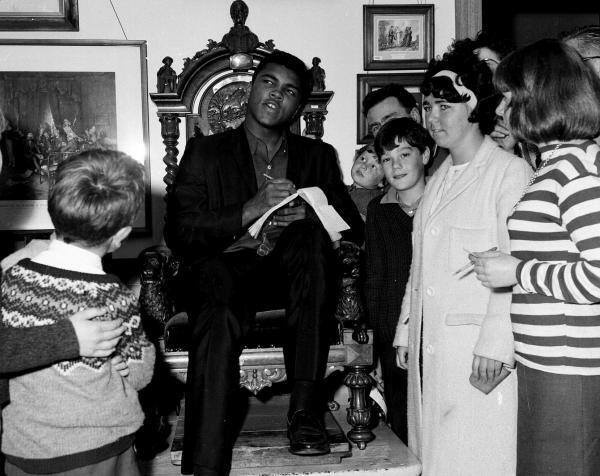 If you are intrigued by this then please read a previous blog by volunteer Alison Wilson about an extraordinary meeting to do with this celebrity visit to Alloway here: https://burnsmuseum.wordpress.com/2016/06/13/memories-of-muhammad-ali/. By Parris Joyce, Learning Trainee. This entry was posted in Art, Burns Cottage, Local History, nature, Object Focus, poetry, Politics, Robert Burns and tagged Brig o' Doon, Burns Cottage, Kilmarnock, kilmarnock printing press, Muhammad Ali, museum collections, National Trust for Scotland, Object Focus, poetry, Robert Burns, Robert Burns Birthplace Museum, Scotland, Tam O' Shanter. 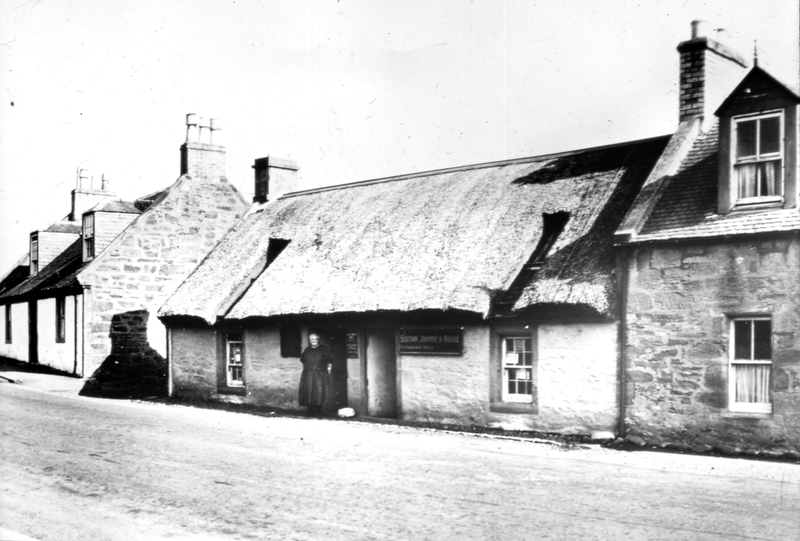 Tam o’ Shanter is Robert Burns’s masterpiece. A long, narrative, epic poem written in 1790 by Burns whilst living at Ellisland Farm, Dumfriesshire and published in Captain Francis Grose’s Antiquities of Scotland in 1791. Burns apparently wrote this in only one night and it appeared in the book just as a footnote! Now Burns was known to have enjoyed superstitious, supernatural stories as a child. His Aunty- a Betty Davison – told him many and Burns said that“[she] had, I suppose, the largest collection in the country of tales and songs, concerning devils, ghosts, fairies, brownies, witches, warlocks, spunkies, kelpies, elf-candles, dead-lights, wraiths, apparitions, cantraips, giants, inchanted towers, dragons and other trumpery.” The poem is full of wild scenes, dramatic and exciting twists and turns, bloody and gothic content as well as witty machoism through the characters and their antics. Many artists have been inspired by the poem and some of the artwork produced really brings the poem to life. 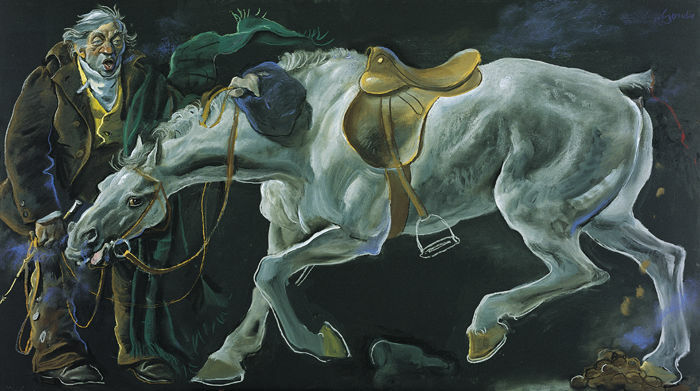 Some of the most expansive and impressive works are that of Alexander Goudie. 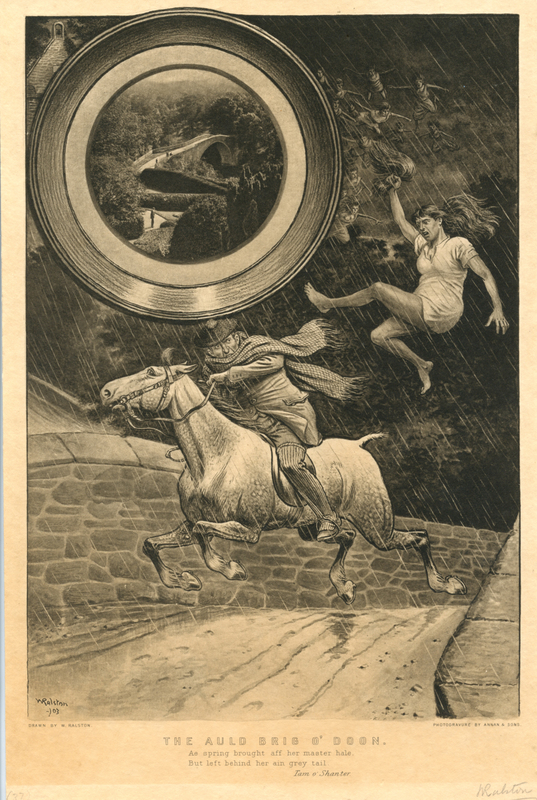 He was apparently totally obsessed by Tam o’ Shanter and his lifelong aim was to create 54 complete cycles of images inspired by the epic tale. He accomplished this and the results are spectacular. A select few will be shown and analysed below. This scene is full of vibrant colours, objects and action: Tam looks well, as does Meg, and they are surrounded by other animals and people greeting them warmly. It is arguably one of the best paintings in the cycle as it has been painted with such attention to detail. This could reflect that this is the part of the poem before Tam boozes at the nappy, thus, he is not intoxicated and he will have a clearer vision now compared to the rest of the poem. The reflection in the window is very life-like as is the woman pulling the curtain aside to have a good nosey at what is happening on the street. 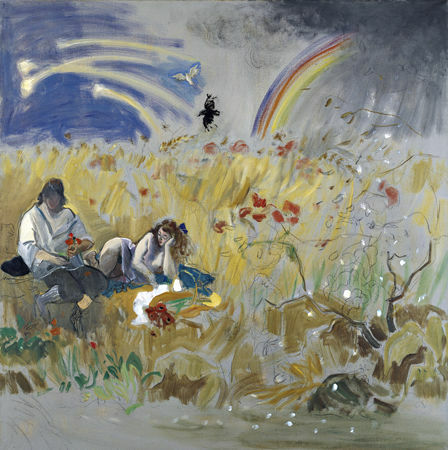 It is worth noting that this painting is number twelve – even though it refers to the first two lines of the poem – so Goudie has used his artistic licence and imagination to fill in the gaps of what happened before this point as well as not putting the images in order according to the lines of the poem i.e. No. 11 “As market days are wearing late” is the line after No. 12 “And drouthy neibors, neibors meet” but it comes before it in the cycle. Till roof and rafters a’ did dirl. 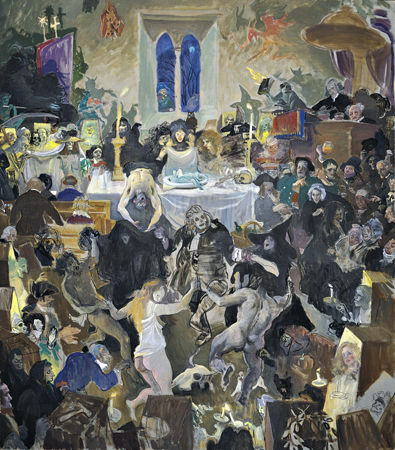 You can clearly see the devil glowering in the back corner, with his bagpipes in hand and mouth, casting a huge shadow on the back wall; the witches and warlocks are in a dance spinning each other around; the numerous coffins encircling the dancers with their skeletons holding candles as light. There is nakedness; there is sorcery going on at the table; the full moon can be seen through the window and the party-goers are oblivious to Tam’s presence. This is another gem of the collection which is similar in the colour and the grotesque but exciting scene depicted as No.31. Tam and Meg are at the mouth of hell itself about to be devoured by the bright flames and are surrounded by all sorts of characters and mythical creatures who are all armed with weapons. Interestingly, the priest and lawyer are present, this inclusion of was famously shocking of Burns back in the eighteenth century. This is a scene which Tam and Meg did not actually suffer but it is a prediction – an insight into the future – of what will happen if they do not escape the ghoulish mob. The feint a tale she had to shake! Hard upon noble Maggie prest. What I like about this interpretation most is that Tam is positively terrified, not composed at all, and has come off his saddle and is hanging around poor Meg’s neck. 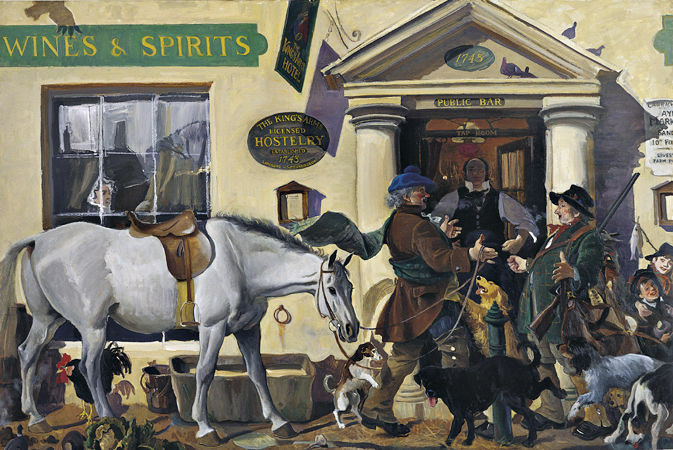 Tam o’ Shanter has a bit of sexism in it with all the drinking, men will be men, flirting with the barmaid whilst the wife is at home worrying drama in it but here Goudie has depicted Tam as being utterly at the mercy of a powerful female character: more so than as how Burns depicted him as Goudie has him literally hanging on for dear life. Here Goudie has used his artistic licence again to create the scene he must have imagined when reading this ending. With only Tam and Meg in the painting: your sole focus is on them. Tam looks haggard, totally drained and panting heavily with his tongue sticking out. He looks like he has aged ten years form his traumatic experience. Meg – the hero of the poem – has also suffered this dramatic change same as Tam. Yes, her tail is gone with only the bloody stump left but she looks aged, thin – bony even – and is cowering by Tam with her head down in fear and she has soiled herself. Altogether, it is not a pretty sight, but a great visualisation of the moral warning in which the poem ends. All of these paintings are now in the collection of Rozelle House Galleries (and some are on permanent display). This is situated in a historic mansion, surrounded by beautiful grounds and also boasts a tea room too. It is just a two minute drive away from the Burns Cottage and only six minutes from Ayr town centre. I would thoroughly recommend any art or Tam o’ Shanter lover to visit. 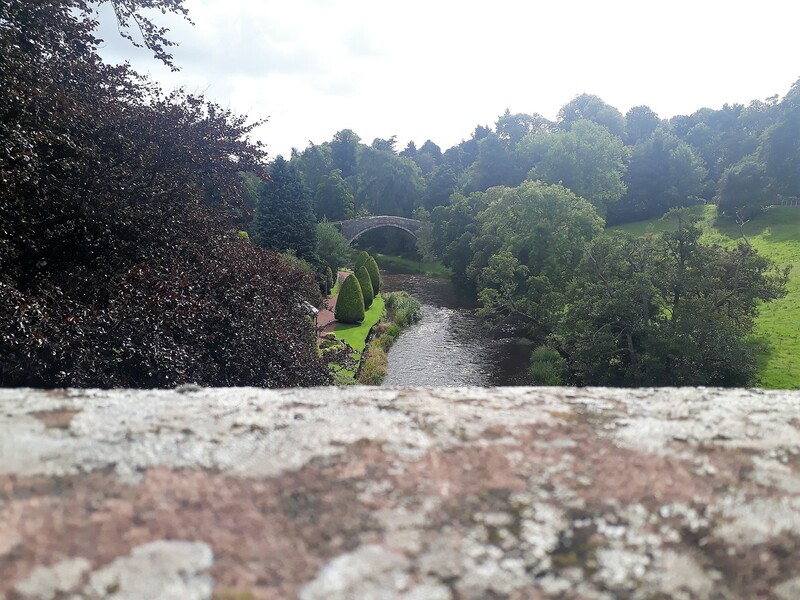 This entry was posted in Art, Exhibition, Local History, nature, Object Focus, poetry, Robert Burns and tagged Art, local history, painting, poetry, Robert Burns, Robert Burns Birthplace Museum, Tam O' Shanter. My name is Sandy. 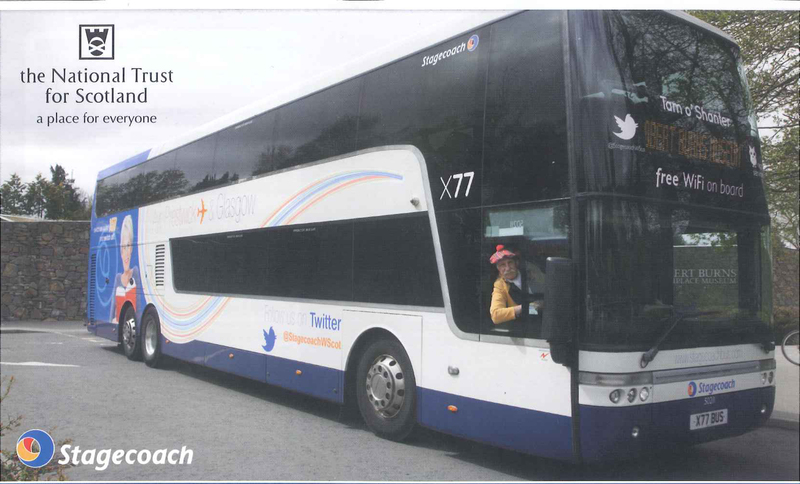 I volunteer at RBBM as a Buggy Driver and Guide. How long have you been volunteering for at the Robert Burns Birthplace Museum and what is your role? I started in 2011, at the time to be 4 hours every fortnight on a Friday. Later I was asked if I would take a school party on the Tam O’Shanter trail which led to taking on other interested parties, from this country and abroad, around the site. While on the Buggy I relate the story of Tam O’Shanter and tell them about the sculptures along the path. I have appeared in costume as Tam O’Shanter for visitors while doing the tours. What kind of things do you get up to when you volunteer? I am involved in the running of the Garden Shop, also appearing in the Christmas Panto at the cottage and the Ghost walk at Hallowe’en, and the Book Club which meets on the last Tuesday of every month. 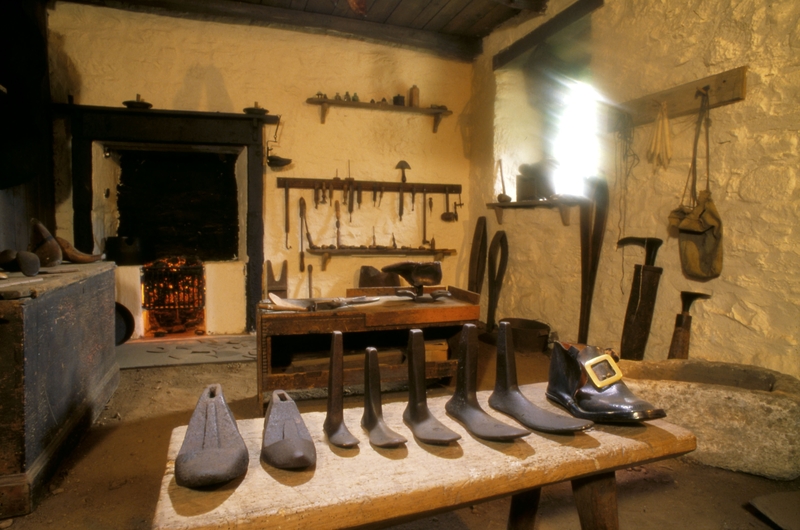 What has been your most memorable experience volunteering at Robert Burns Birthplace Museum? Taking a wedding party on the Buggy from Alloway to the Church next to the Brig O’Doon Hotel (Dressed as Tam of course!). 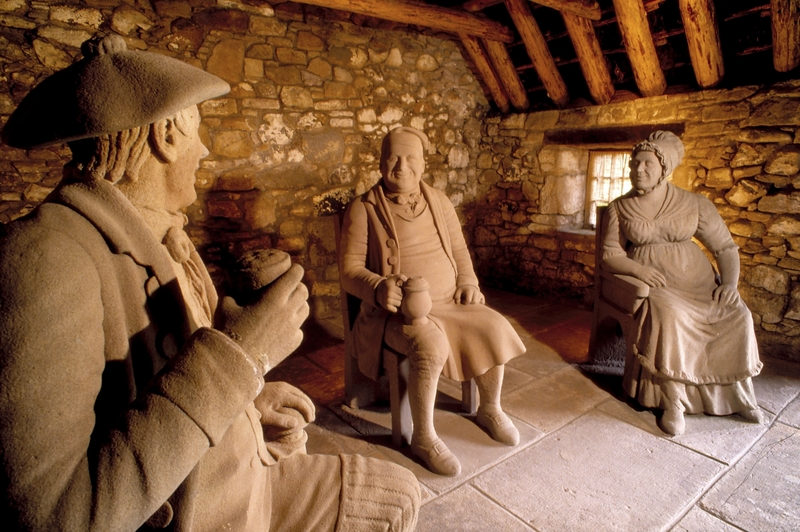 What is your favourite thing about Robert Burns Birthplace Museum? During this time I became very interested in the Old Kirk and its headstones. I have given talks on the Kirk which then led to a project which has taken a year, looking at the headstones and their condition since 1995. In 2014 I was awarded the Volunteer of the Year Award for the National Trust for Scotland. Which was a huge surprise and great honour. Why have I been at RBBM for 4 years? I worked for the Scottish Ambulance Service for 38 years, when I retired, I was very interested in the construction of the museum, so was down many times to watch the progress, often I was asked about the museum, or how to get to the cottage. I enjoyed helping them, which led me wishing to know more about the area. So it’s the satisfaction that I have made the visitors’ visit interesting, knowledgeable and enjoyable! And if you wish to meet me look in the Kirkyard! 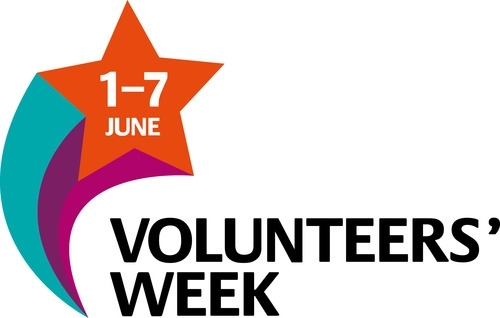 This entry was posted in Volunteer Week 2015, Volunteers and tagged Alloway, Alloway Auld Kirk, Ayrshire, Book club, Robert Burns Birthplace Museum, Tam O' Shanter, Volunteer Week 2015, volunteering, volunteers. This painting is of an idyllic, almost pastoral scene; a visual representation of the same warm fuzzy feeling in which Burns wraps his audience with the Cotter’s Saturday Night. Picturesque? Yes. Realistic? No. The perspective of the picture is distorted, and rather than cast aspersions on the skill of the painter, I rather think that he is hinting at the Brig’s otherworldly connections, its shadowed underside hiding dark secrets. Not always quite so serene, there is the suggestion of Tam’s frenzied ride over the Brig pursued by the howling witches. From this slightly more sinister perspective, we as viewers are part of the dark foreground of the picture, looking in. Are we the witches, waiting on the sidelines to be let loose on the chocolate-box landscape? The Corinthian columns burst through the Scottish countryside as a conquering edifice, symbolising the achievements of man but running in counter to Burns’ perception of man’s dominance over the natural world as a sadly destructive force. And yet, not all has been conquered, not all is lost to the order of Enlightenment. The wild darkness is on the edges, just waiting to get in. So how would you read this painting? This one of the objects acquired by the museum with the help of the National Fund for Acquisitions, which celebrated its 60th birthday in December 2013. 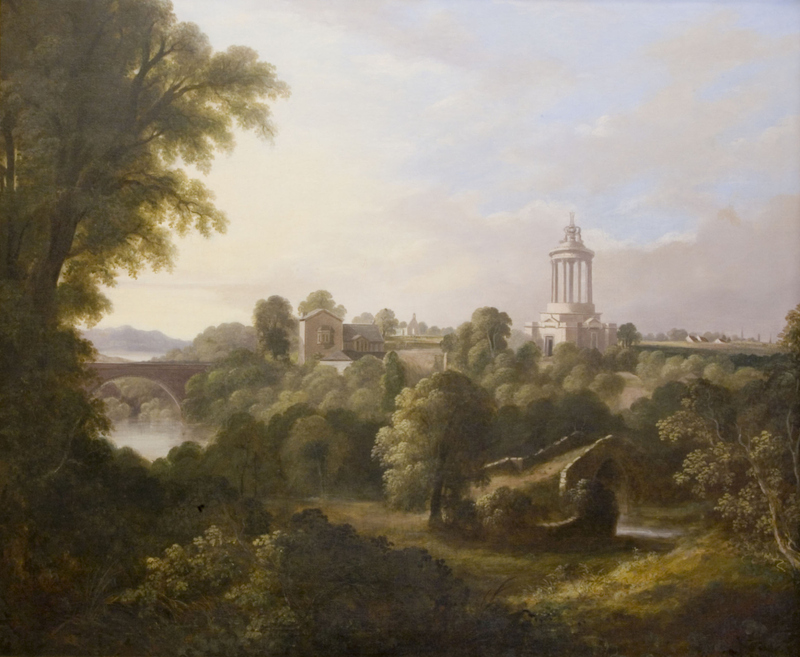 This entry was posted in Object Focus and tagged landscape painting, Patrick C Auld, Tam O' Shanter.